What is Happening to Betelgeuse? Betelgeuse is a star constallation of Orion, which is well known for being very unstable and possibly exploding in a supanova at any point. It's a star that is often studied by astronomers, but before they can understand how a star goes supanova, they need to understand what the steady state of a star really is. You need two forces that have to be in equilibrium: gravity which pulls inwards and tries to squeeze the matter together; and pressure (radioactive and gas pressure) which pushes outwards. While gravity wins, the star shrinks; but wile pressure wins the star diffuses into space. In fact no star has a perfect equilibrium state, because they're highly dynamic objects. Even our sun is continually trying to balance the gravity and pressure, and therefore its radius can change; although for the moment the effect of that is so small, Earth doesn't really feel a thing and life is okay with it. Betelgeuse is a very special star to astronomers because it's a pulsating star. These stars can vary very radically on very short timescales: years, months, days or even hours; depending on how pressure and gravity balance within the star. So how does this star become unstable? 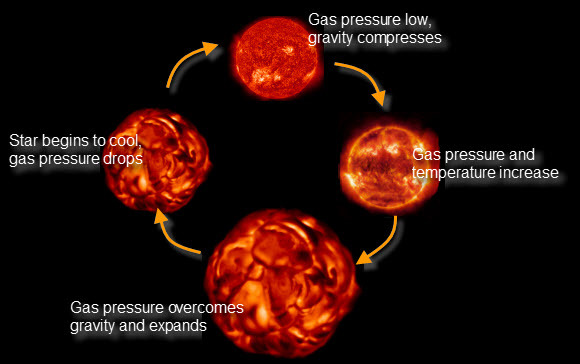 If the gas pressure in some layer is too low to balance the gravity, the layer is compressed which will cause the temperature and pressure in that layer to increase. Eventually the pressure will overwhelm gravity and the star expands. All the energy that couldn't get through is suddenly released. Once this happens, the star starts to cool down, and the gas pressure drops to the point where gravity will take the lead. Betelgeuse's is classed as a "semi-regular variable star": its cycles vary in length over a long period. In its final phase it will explode as a supanova. It's very hard to predict exactly when this will happen, but when it does, it may be as bright as a full moon for a while, before almost totally disappearing and ruining the constellation of Orion! The video and material for this article was made by UK Astrophysicist Sebastian Pines, creator of the 'Astronomic' YouTube channel. You can support Seb's work creating videos that help to teach the world about astronomy by sponsoring a dollar or two per month via his Patreon page. Home > Cosmology Corner > What is Happening to Betelgeuse?